Took a while of frustrating debug to realize that my cable had a counterfeit FTDI chip in it; FTDI bricked it giving it a PID of 0000 but it still showed up in windows and spit out "NOT GENUINE DEVICE" or similar when receiving bytes over the UART. If you're a radio enthusiast, I successfully programmed Yaesu, Icom, Wouxun, Puxing and Baofeng radios with this cable. Should work with Kenwoods and many cheap Chinese radios as well. Works well as a C-IV control cable with Icom HF radios. Add an optocoupler and it will work as PTT control with Ham Radio Deluxe, AGW Packet Engine and similar. Email me if you want more info. I can't find it in your profile. It's probably in some stupidly obvious location. Does this cable do auto-reset for the Arduino? I just received the the FTDI 5V cable to use instead of the FTDI basic on a mini-B cable. When switched from basic to cable got avrdude error msg "avrdude: stk500_getsync(): not in sync: resp=0x00". Had the error before when setting up the basic but was due to improper board setting in arduino IDE. Had selected "Arduino MIni with ATMega 328" when realized my board was Pro... further down in the list "Arduino Pro Mini 5V....". Drivers were installed when plugged in cable (COM8 vs basic on COM 7). When connect cable to USB get power to Arduino but fails upload. Checked that black lead is on GND pin....any suggestions? Does the driver for this work with Windoze 8.1? My "old" cable didn't work with my new laptop. Would this work with a Raspberry Pi? 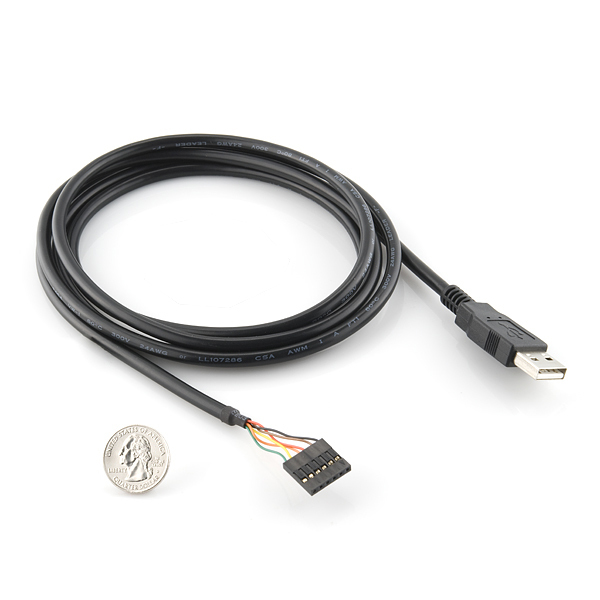 I'm planning on plugging the USB end to the Pi, and the other end to a coin acceptor (the one that Sparkfun sells). thanks! Will this work with 3.3v Sparkfun brand arduinos? Yes and no. 3.3V Arduinos for the most part are not any different then their 5V versions with the exception of the voltage regulator and the speed (16MHz is not in spec for 3.3V so we use 8MHz). These boards will run just fine on 5V. But you are running them at 5V so make sure you don't have anything connected to the VCC line that can't handle 5V. Would this work for the EL Sequencer? Yup, this has a compatible pin-out. It sounds like you may be looking for just a jumper cable. Something like this, perhaps? I honestly haven't seen a 10 pin version anywhere to recommend where you could buy one, but you could use a 4 pin glued to a 6 pin jumper wire, to hack your own 10 pin version relatively easily. I bought one of these to use as an interface cable to my HF radio and it worked well until I damaged the cable. So I bought two more (for redundancy this time) and get this -- neither of my new builds will transmit to the radio at all. The damaged cable still works but I don't consider it reliable. However, since neither of my new cables work I am stuck with the old one. I compared the connections I made for my working cable to the new cables and verified they were wired the same. So my only thought is that something changed in the build of the cables I just received. Maybe the wire color coding changed? Or the internal circuitry? Sitting here in a funk as my only working cable is the "bad" one, after wasting $50 to build up a pair of new cables ($18/cable plus $8/connector) that don't work. Does this work with windows 8? I have 3 little $3 USB to 3.3V TTL boards that no longer work as well as a USB to serial cable. These all use a Prolific chip that seems to be "obsolete" so I'm looking for a replacement. It should. Check out FTDI's website, they mention some type of compatibility with Windows 8. If anyone is having problems having this cable show up as a USB device and a com port, simply wiggle it around in all directions slowly and carefully. Once you get your computer to recognize it and have it install the drivers, you will be set for plug and play operations. If you successfully get the drivers installed and it comes up as a com port and it disappears/reappears constantly, the cable may have a loose connection and you should contact technical support. Just received and tried to use this cable with the Ethernet Pro Arduino (DEV-10536) but can't get any of three different Macs to recognize the cable. I've installed the most current drivers from FTDI but the computers never see it. I have an Arduino Mega that is recognized properly. The ethernet pro does turn on and run its OOB blink code, but sometimes will instead just turn on its led dimly and do nothing. Thinking either the cable or the board is bad but not sure. Anyone run into this before? 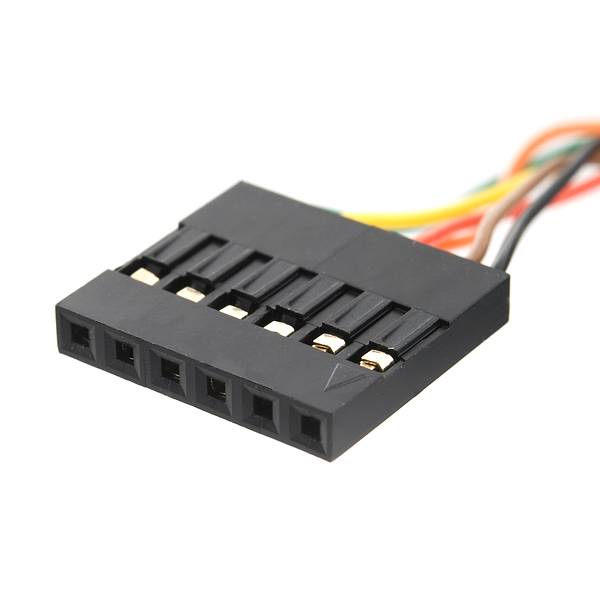 Hey just wondering which is more suitable for the ArduIMU the 5v I/O or the 3.3V I/O. Just wanted to check before I release the magic smoke. When we are going to get these more? Check the schematic link above. I think that it would be pretty awsome to see one of these with an ATMEGA8u2, like on the Arduino Uno... It would be faster... Just saying... These are cool too, but you caould add it along side. is the rts signal any different or worse than dtr? Is there a good tutorial and parts supplier so i can make my own custom wiring harnesses like this? What is the maximum current this cable can supply through the 5V wire? The schematic shows an inductor in series with VBUS which becomes 5V. Maybe in the next revision, have another leg of VBUS that connects directly to 5V. An initialized USB port can typically supply 0.5A@5V however some ports that are part of hubs or integrated into other devices source down to 100mA when initialized. The inductor on the schematic is most likely a ferrite bead and the 30 ohms is the impedance at a fairly high frequency like 100 MHz. The dc resistance is more likely 30-50 milliohms. Having said that, SparkFun should probably place a note on the schematic describing both the AC and DC resistances to better inform their customers. Yeah.. I ordered 2 of the 5V boards about 3 days ago. This would have been even better since I plan on soldering some headers and long cables to it. The device would seem to have the authentic FTDI chip since the Windows driver loaded nicely (not bricked or blocked as for fake chips). Cable works nicely with my Arduino Mini Pro programming. Does everything it should do. Does what its supposed to when connected to the mega pro. Use to load sketches and receive serial data. Works just like a USB cable on a regular Arduino. I have the FTDI break out board also but prefer this cable for simplicity's sake. Hooked it up, plugged it in, worked first time. What else could you want? It worked! I did have to go into Windows Control Panel-Device Manager, find the COM port and use the Advanced settings to change from COM11 to COM1 for my application, but otherwise, it worked without a hitch. The link provided to the driver in the item description was especially helpful. I know buying a cheaper one can be risky, but these are priced high, so for my next one I bought it for less than half the cost of this one...we'll see how it goes. Even though I only needed the CTS of this cable it worked when one I got from China did not. I am not a programmer or developer. I am a musician using eurorack modular equipment. I had some modules that needed firmware updates and this cable got the job done. The USB cable was a better choice for me over the basic breakout board because of convenience factor. With this and some jumpers cables I will be able to update any module that uses this method for updating. Great little device. You need a usb cable for the FTDI breakout anyway, why not just get one built in? A must have for communicating with boards using terminal programs like RealTerm and PuTTY. Plop a serial header on your PCB and you are off to the races. Works as advertised... wires are a little on the small size. I call these "magic cables". I buy them 5 at a time, and I'm up to at least 20 by now. I use PIC micro-controllers on wire-wrap boards for most of my projects. 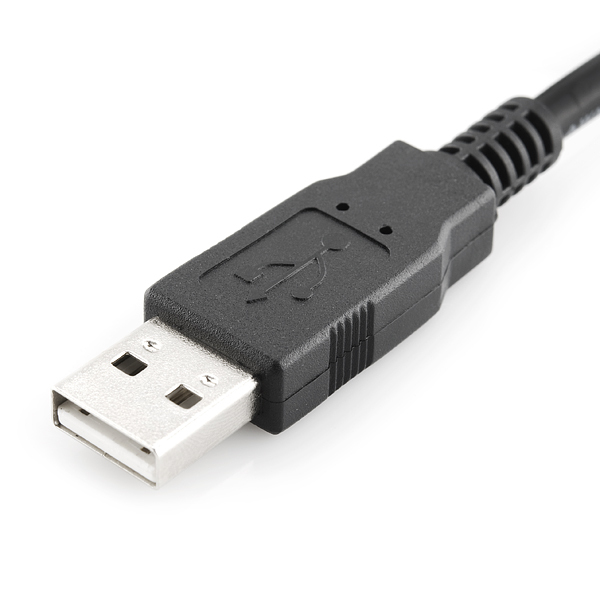 This cable provides two-way communications with the PC, and even powers the PIC. It works great with custom VB.NET apps, or PuTTy, a free terminal program. It even works reliably up to 2 MBaud through the Windows COM port interface! I dread the day when they are no longer available, hopefully many years from now. This thing has been a pain since I bought it. I needed a 5V TTL serial adaptor a few months ago. I decided I didn't want to gamble on a fake FTDI chip so I bought from Sparkfun. The application is an 8192 baud serial link for GM cars. Due to the odd baud rate, the only two chips that will work well are FTDI's FT232R series and the Silabs CP2102 series...and since it's standard TTL, that makes the FTDI the easiest solution. Well, it's been an absolute nightmare to keep this thing working. One download, it's fine, the next, it's corrupting the firmware in the car's computer. Pull everything, put it on the bench, different wiring, different computer, different PC, same issues-sometimes it works, sometimes it's garbage. No rhyme or reason to it, I can't even get the thing to fail a loopback test-but you can't send data over it reliably. Even tried talking to the arduino with it, same results...sometimes it works, sometimes it doesn't. I hope the next one works better than this one. This cable works fine if you are using the assembly in a 3-wire mode but if you need to use it in a full-handshake UART mode, this cable is missing critical signals. I'm not certain why the folks at Sparkfun just didn't bring out all the RS232 signals from the FTDI IC and let the user decide which to use. It does what it's supposed to do. Easier to use than the breakout board. Haven't used it yet as this will be part of winter projects. Too many outdoor projects to complete before snow is dumped on us. When the weather gets cold the Arduino projects are on the bench for learning and building. This work exactly like I need and the quality is so much better than the knock offs. Just wish it wasn't so expensive. Doubles my BOM cost. Used this with the Pro device. Works great. Used Mac and Windows 10, both work fine. There was no special driver to install due to fake chipset. Contains the real thing chipset! Windows 10 recognized and setup the correct driver with no issue! Supplied sufficient power to Arduino Pro Mini 5V for proper operation. Works great to clean up my RigExpert AA-30.zero antenna analyzer setup. Works great with 8052-BASIC MCU trainer I'm making. I use this with an 1802 Membership Card, connected to a Gentoo Linux workstation, and I/O at any baud rate supported by the 1802 firmware works. Thanks for the review, and for mentioning the 1802 Membership Card. I'll have to check that out! Works with Windows 8.1 and is great for roomba SCI interfacing.